PRI’s Middle East and North Africa office organised a Egyptian Delegation round table in Amman this week on implementing the use of educational measures and non-custodial alternatives mentioned in the Egyptian Child’s Rights. The meeting was chaired by His Excellency Counselor Ahmed Hamdi Abdel Hamid ElSergany, Assistant to the Minister of Justice for Human Rights in Egypt with the participation of a team of judges and prosecutors as part of the cooperation between the Ministry of Justice and PRI and the Egyptian Coalition on Children’s Rights. In his key note address, Counselor Ahmed Hamdi Abdel Hamid El Sergany expressed his pleasure to attend and participate in the collaborative meeting focusing on children as the “the core of society” and stressing the importance of an effective justice for children in Egypt. His Excellency also affirmed the importance of this meeting, organised by PRI to gain a common understanding of the opportunities and challenges of promoting justice for children in Egypt, to encourage and initiate enhanced coordination among actors that address justice for children and to agree on priority areas for future intervention. He also added that the outcome of the discussions and recommendations will be of great benefit knowing that the judges and prosecutors participating in the meeting were chosen based on their experience and knowledge in the field. Mr. Haitham Shibli, acting Director of PRI’s Middle East and North Africa office, welcomed the delegation chaired by Counselor Ahmed Hamdi Abdel Hamid ElSergany, and thanked His Excellency for his attendance, adding that it will give great value to the meeting. Mr. Shibli also thanked Mr. Hani Helal, SG for Egyptian Coalition on Children’s Rights for his efforts and achievements and support in coordination of these meetings. Judge Ashraf Hijazi, Director of the Department of Child Protection at the Ministry of Justice, presented a study on alternative measures in the juvenile justice system (a case study in Jordan, Egypt and Yemen) engaged in contributing to the criminal justice reforms, to establish a juvenile justice system that would focus on the rehabilitation and reintegration of children in conflict with the law into society. The study aims to prevent children being criminalised unnecessarily, and to create programs of prevention and diversion, and to ensure that personnel dealing with juveniles are adequately trained. It also aims to establish independent inspection teams to prevent abuse and violence against children in detention. 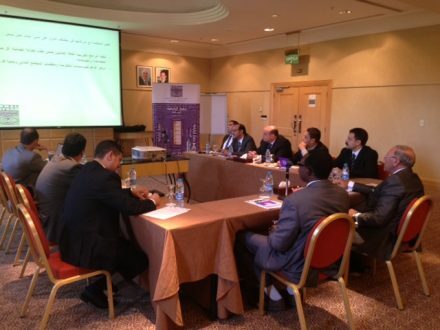 PRI’s Middle East and North Africa recently established the National Independent Inspection team for monitoring care centres in Jordan to ensure that these institutions are administered in accordance with existing laws and regulations and with a view to bringing about the objectives of penal and correctional services. During the discussions, the participants were divided into working groups that were each assigned to tackle a specific issue related to justice for children. The round table was concluded with a presentation of the recommendations of each working group. provide support to governments and civil societies to establish and develop independent inspection teams to prevent abuse and violence against children in detention. This manual is designed to identify and promote the use of global juvenile justice indicators. It was initiated at UNICEF and is published by UNODC.